Remember that masked crime fighter created by Bob Kane? The one whose superhero namesake is named after an animal? The one with a young sidekick? The one whose car and secret lair are also named after his animal persona? Yeah, that one! That’s right, Courageous Cat is coming to the big screen. According to Deadline, Evergreen Media Group has made a deal to acquire the rights to the 1960 cartoon and are hoping to turn it into a live action/CGI hybrid film with an all new mythology for the character. 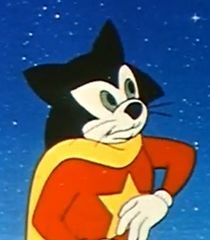 For those not familiar, Courageous Cat and his partner Minute Mouse was created by Bob Kane as a parody of his creations Batman and Robin. As Wikipedia puts it: In the animated series, the pair are anthropomorphic animal superheroes without secret identities (the green-eyed caped crimefighter and his squeaky-voiced companion are usually addressed as simply “Courageous” and “Minute”) who live in the Cat Cave and, when summoned via the Cat Signal over their television set, race to the scene of the crime in their sleekly feline red Cat Mobile which can convert into both the extendable-winged Cat Plane and submersible Cat Boat and thwart the criminal plots of various villains who threaten Empire City.